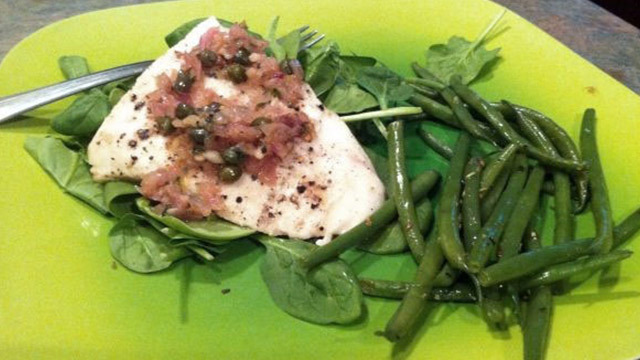 This easy recipe incorporates lemon, capers, wine and butter in a pan sauce that is prepared quickly and then served over pan-seared Mahi Mahi, or other white fish. The lemon and capers balance the wine's natural acidity, while the butter creates a silky texture to match the body of this Chenin Blanc. Simple steamed vegetables are a good accompaniment for the fish. 4 Mahi Mahi or other firm white fish fillets, each 6 to 8 oz. If using salt-packed capers, place them in a small bowl, add cold water to cover and soak for 20 minutes. Drain, rinse well and drain again; pat dry on paper towels. If using vinegar-packed capers, rinse under cold running water, drain and pat dry. Season the fish lightly with salt and pepper. In a large, nonstick fry pan over medium heat, melt the butter with the olive oil. Arrange the fish in the pan and cook, turning once, until browned on both sides and opaque throughout but still moist looking in the center when tested with a knife (approximately 6 to 8 minutes total). Using a slotted spatula or spoon, transfer the fish to a warmed platter and cover loosely with aluminum foil. Add the shallots and garlic to the pan and cook, stirring often until fragrant, about 2 minutes. Add the wine and lemon juice, increase the heat to medium-high and boil until the sauce thickens slightly, 2 to 3 minutes. Stir in the parsley, capers and lemon zest, and season with salt and pepper. Pour the warm sauce over the fish and serve immediately.